The Times of Malta covered a brewing controversy over Jewish remains found in Rabat catacombs. The Jewish catacombs are part of the St Paul's catacombs in Rabat, discovered at the end of the 19th century and dating to the late Roman period some 1,500 years ago. The Maltese Jewish community called in international experts from Israel and the US to provide proper burials according to Jewish law, and the controversy began. The visit of the delegation was confirmed by CEO of Heritage Malta, Luciano Mulè Stagno, who said a police report was made a policeman place on guard outside the entrance. The Jewish community's representative, Lawrence Attard Bezzina, denied the delegation entered unlawfully. The site may be government property but the Jewish community says the bones are not. Additional meetings are planned. For some idea of how the paper's readers feel about the issue, take some time to read the comments to the article. Restoring Jewish cemeteries through lottery funding is a possibility in the UK. According to the Liverpool Echo, the city's historic Deane Road Jewish cemetery has applied for lottery funding to aid its restoration. Deane Road Jewish cemetery in Kensington is the final resting place of some of Liverpool’s best-known entrepreneurs including David Lewis, pioneer of Lewis’s, and Moses Samuel, founder of H Samuel. The cemetery, which has around 750 gravestones, opened in 1837 but the last burial was in 1929 and it had become derelict before a new campaign to refurbish it was launched three years ago. Patrons include Liverpool solicitor Rex Makin, Lord Lieutenant Dame Lorna Muirhead, and well known actress (and Jewish genealogist) Miriam Margolyes. The group has put in a bid for £220,000 which should fund a total restoration, including replacement, repair or refurbishment of boundary walls, gateposts, railings and front archway, as well as to re-erect all gravestones in good condition. The Old Liverpool Hebrew Congregation owns the site, which has an ornate Greek-revival style archway entrance and a driveway flanked by cast iron railings. Burials include Liverpool's first Jewish mayor Charles Mozley, and painter John Raphael Isaac. For more on notable Sephardi and Ashkenazi personalities who rest in Deane Road, click here. These detailed biographies include family histories, illustrations, links, and other grave references. 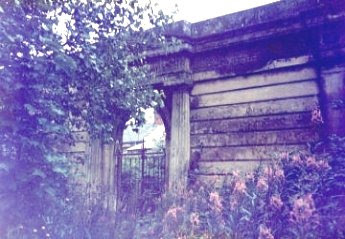 It is hoped once restoration is complete, the cemetery will be added to Liverpool’s heritage trail. For more details on the cemetery, click here. For the history of the cemetery, click here. The Lo Tishkach Foundation has published a new Catalog of Jewish Cemeteries of Masovian Region in Poland. The information was reported by the International Survey of Jewish Monuments (ISJM). Jewish tradition regards burial grounds as sacred sites which must never be disturbed. Jewish cemeteries and mass graves also provide a vivid focal point marking the destruction of Jewish communities and for learning the lessons of the Holocaust. They stand as testimony to the history of Jewish community life across the European continent and are an important part of Europe’s diverse cultural heritage. The report (October 2008) on the current state of Poland's Jewish cemeteries reveals that dozens are still unmarked and neglected, while others have been built over completely. The Lo Tishkach Foundation (Hebrew, "do not forget") commissioned the report - Jewish Cemeteries of Poland: Masovian Region - which focuses on the 126 Jewish burial sites of the Masovian Voivodeship, Poland’s largest region. Lo Tishkach also reports on databases of Jewish cemeteries in Ukraine (some 800 cemeteries). This perhaps the most complete record in English of Ukrainian Jewish mass graves. Search the database here. The database record contains at least the location and address of each cemetery plus basic information on the specific geographical location of the town or village as well as the source from which this information was compiled. Some cemeteries indicate additional information is found at the IAJGS Cemetery Project Database. 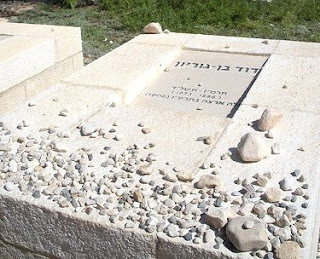 Jewish cemeteries: Why do visitors leave stones? Why is this grave covered with stones? I recently returned from Israel with my confirmation class where we occasionally visited the graves of famous Zionists. The grave pictured is that of Israel's first Prime Minister David Ben-Gurion. That of his wife, Paula, is adjacent. Seeing this as a teaching moment, I offered the kids what I call an SAT word; in this case, “cairn.” Dictionary.com defines a cairn as a heap of stones set up as a landmark, monument, tombstone. Of course, as Jews, we’ve been leaving stones on tombstones for eons. We all perform this rite, but don’t always know why. 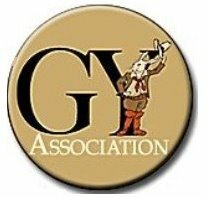 When looking for a good website to teach Jewish cemetery customs, I recommend the The Jewish Cemetery Association of Massachusetts (JCAM,) which offers the following explanation. The origin of this custom began long ago, when the deceased was not placed in a casket, but rather the body was prepared, washed, and wrapped in a burial shroud, or for a male, in his tallis (prayer shawl). Then the body would be placed in the ground, covered with dirt and then large stones would be placed atop the gravesite, preventing wild animals from digging up the remains. Over time, individuals would go back to the gravesite and continue to place stones, ensuring the security of the site and as a way to build up the “memory” of the loved one. As time passed on, and carved monuments became the preferred memorial, the custom of leaving a visitation stone became a symbolic gesture–a way for the visitor to say to the loved one, “I remember you…..”. JCAM provides for this custom on our cemeteries by filling receptacles with small stones for our visitors to leave, so you too, can continue on with this ancient custom of remembering. Perhaps you have additional customs and explanations to offer? 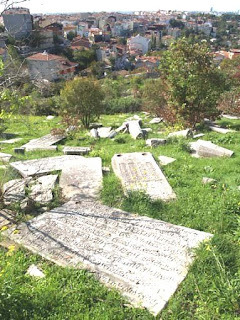 Although Carnegie Museum of Natural History research associate Aydin Örstan specializes in mollusks and snails, he did spend an afternoon at one of Istanbul's old Jewish cemeteries back in October and recently blogged about it, adding some of his beautiful photographs. He and a friend climbed over a high metal fence to get in to photograph the tombstones (and collect snails!). "Only much later, at the end of our expedition did we realize that there was a regular entrance for the use of perhaps slightly more normal people. The cemetery consisted of an old section on a gentle slope overlooking residential districts and a presently used smaller section on a facing hillside. We concentrated our efforts in the old section where many marble tombstones were scattered, some haphazardly, over the hillside." 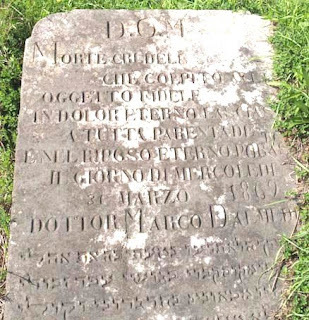 The oldest inscription they could read that day was that of a Dr. Marco Dalmedico from 1869, and another for Raphael Delmedico was also located. Aydin's research showed that the cemetery was much older than the stone they had found. Brewer (1830) mentioned a visit in 1827 to a "Jewish burying-place near Coos-Conjux on the Asiatic side [of Istanbul]" that was undoubtedly the same cemetery in Kuzguncuk, while according to Rozen (2002), the oldest Jewish tombstone in Kuzguncuk is from the 16th century. Read the complete blog post at the link above and view more of Aydin's photos. Thank you, Aydin, for allowing readers to share in your adventure. Rudy Couvreur is a documentary photographer and blogger. 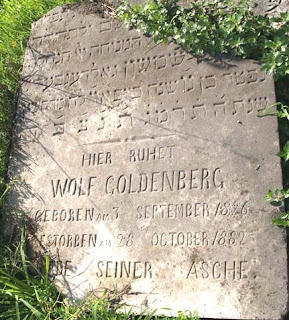 He has beautiful photographs and interesting text on the Bonn Jewish Cemetery - Schwarzrheindorf - on this blog post. The photo above is that of a Kohen - although I cannot see enough detail to provide the name of the individual. We know that the person buried there is a Kohen - a descendant of Aaron - because of the traditional depiction of two hands with fingers held in a distinctive pattern. On the Rhine's right bank, it is one of the oldest Jewish cemeteries in North Rhineland and is today under the administration of Dusseldorf's Landesverbandes der judischen Kultusgemeinden. The first burial of more than 400 graves was in 1623 - Schabtai bar David. The last burial was in 1992, that of Theresa Weidenbaum, nee Bachem, widow of Theodor Weidenbaum. Until 1873, nearly all the Jews of Bonn were buried here. In 1818, Bonn's Jewish community acquired the site and shared it with the community of Villich/ Beuel. From 1873, a new Jewish cemetery (Bonn-Castell) was opened for Bonn. In 1898, Schwarzrheindorf was divided by the Bonn community, with the northern section for Villich/Beuel burials and for others, but the Bonn Jewish community no longer used the southern section because they had the new Bonn-Castell site. During World War II, Schwarzheindorf became overgrown and was severely damaged in 1939. In the 1950s and during 1966-1968, it was restored. An entrance memorial, erected by the city of Beuel, honors the Holocaust victims. Read the complete post and see Rudy's photographs at the link above. He also has another post, with more details on Bonn's six old Jewish cemeteries and more photos. Three are in the Bad Godesberg district: Alter Friedhof (1703-1901), Neuer Friedhof (1895-1957) and the Judischer Friedhof Mehlem (1868-1941). The others are in Bonn-Castell (1861-1963, and mentioned in the post above), Bonn-Endenich (1861-1963) and Beuel-Schwarzheindorf (1623-1956, also mentioned above). He also notes that, since 1996, there is another new Jewish cemetery at Uckesdorf, Am Gottgesbach. Do read both of Rudy's posts at the links above. Rabbit looks forward to learning about more of his cemetery visits! This is one of a series of posts about Venezuela's Jewish cemeteries. Venezuela is located at the northern end of South America, covers some 912,050 sq.km. and has about 30 million inhabitants. The capital, Caracas, is located in the central-north and is the country's biggest and busiest city. It is also the center of the Jewish community. The Jewish community of Caracas numbers about 10,000 members, has more than 20 synagogues, a Jewish day school, a Jewish community center and three main cemeteries ("Guarenas," "Cementerio General del Sur" and "Cementerio Del Este"). The Ashkenazi synagogues are UIC and Rabinato; AIV is Sephardi. The Cementerio General del Sur is the oldest and largest. It contains four Jewish sections: UIC manages two, Aiv one and Rabinato one. One of UIC's sections is the oldest cemetery in Caracas, containing about 30 tombstones dating from 1930. The other UIC section opened in 1937, with the burial of Rebeca Hoires on December 5, 1937. Currently there are 2,365 graves and although there is room for a few more, it is being replaced by the Guarenas cemetery "Gan Menucha," which opened with Adam Slimak's burial on April 17, 1997. Currently, there are about 300 graves, with room for up to 3,000. The AIV section contains some 180 graves from 1953-1971. It is no longer used and has been replaced by the Cementerio del Este with about 500 graves. The Rabinato section is still in use. The first burial was Abraham Lederman on October 18, 1972. Currently, there are 755 graves with room for up to 1,500. Jewish burials in Venezuela are usually scheduled from morning until about 3pm, and the tombstone is usually unveiled 11 months after the burial. From the time of the burial to the unveiling, the deceased's family does not generally visit the cemetery. Tombstones are inscribed in Spanish with Hebrew used to write the deceased's names and dates. The family may also choose to include a few lines about the person and/or a Psalm. The majority of tombstones have, at the rear, a very small "house" to light a candle in memory of their relative's soul. 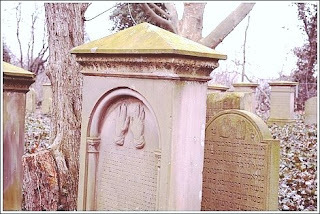 It is a Jewish custom to leave a small stone or pebble on the tombstone after visiting a grave.